PLB-Wonder Bay Development Sdn Bhd is launching at year-end the third phase of the RM100mil Sri Saujana project, comprising over 700 apartments, at Gat Lebuh Macallum here. The first phase, comprising about 700 units, was completed recently, said manager Lau Eng Hee. “We are now applying for the certificate of fitness for the first phase. 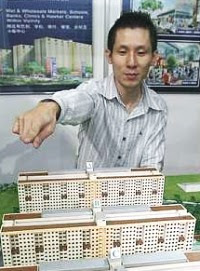 Over 30% of the second phase, comprising over 700 units, has been sold since the launch earlier in the year,” he said. The second phase is scheduled for completion next year. PLB-Wonder Bay is a joint venture between PLB Leisure Sdn Bhd and Wonder Bay Sdn Bhd. PLB Leisure is a subsidiary of main board-listed PLB Engineering Bhd. Lau said Sri Saujana sold well because it was located in the heart of Georgetown, a stone’s throw from the ferry terminal, downtown shopping malls, Komtar and the Jelutong Expressway. “The government has planned for the future monorail station to be next to Sri Saujana,” he said. Lau said the apartments were priced at RM75,000 for a three-bedroom unit.